Hands-on learning is an educational method that directly involves the learner, by actively encouraging them to do something in order to learn about it, in contrast, to simply told facts and made to learn them by heart. In short, it is ‘learning by doing’ and It is based on a constructive learning method. Furthermore, hands-on learning allows students to directly observe and understand what is happening. It is often hard to properly understand something you have never directly seen or experienced. This is why hands-on learning has become more popular in education. Learning by Doing is more effective over classroom training as it makes participant from being receivers of information to being seekers of information. First, gaining practical experience puts education theory into practice and thereby makes it more relevant. Learning by doing philosophy delivers value to theory and significance outside of the classroom. Below are the reasons why Hands-on learning is the future of learning. Accelerates Learning: Repetitive Learning or learning by rote has long been replaced by ‘Learning by Doing.’ Hands-on Learning methodology uses critical thinking, problem-solving and decision-making to deliver a training module. This has become an established method to accelerate learning. Provides a Safe Learning Environment: Simulations use real life scenarios that depict several challenges, which a participant will eventually face after the course completion. It is only natural that mistakes happen during the course of learning, and using simulations is like taking kids to a playground, and getting them to have fun, try new things and learn, in a safe controlled environment. Bridges the Gap between Theory and Practice: By moving beyond theory to the realm of “learning by doing,’ the trainee gets a first-hand experience of practicing what has been taught. This plays a crucial role in retaining concepts and ideas. Produces Demonstrable Mindset Changes: There are very few learning methods that can have a dramatic impact on the participant’s mindset. Hands-on Learning is one of them. Leadership cannot be learned by reading about it”. 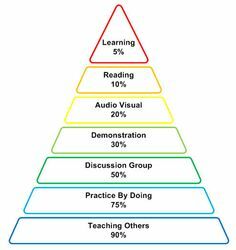 Increases Engagement Levels: The high focus on collaboration and learning from each other benefits the participant as it increases engagement. On the other hand, since the participant is immediately involved in the problem-solving activity or event, the level of ownership of the outcome is high. Delivers Exceptional Return on Investment (RoI): Hands-on learning is personal and effective in nature, influencing both feelings and emotions as well as enhancing knowledge and skills. It goes beyond classroom learning and ensures that there is a high level of retention, thereby delivering exceptional RoI over a traditional learning program. Provides Accurate Assessment Results: Assessing the effectiveness of the training program in terms of the benefits to the trainees and the company is a crucial element of any learning program. Most assessments are data driven and traditional tools use tests to measure effectiveness. When it comes to Hands-on learning programs, it is extremely difficult to gather data, which can be used for assessments. This is where analytics come in. When combined with simulations and gamification, experiential training products become a powerhouse of data, which can be used to deliver assessments results accurately across cognitive learning, skills affect and objective results. The analytics engines in these simulations record analyze and provide a detailed report on the participants’ interaction throughout the simulation. The complexity of real world situation of engineering education has obvious limitation of instructional presentation and training. Simulation gives a result from the theoretical representation of complex phenomena when hardware for the task is lacking, or in situations when enough time is not available for explanation. Incorporating Simulation in Hands-on Learning makes learning more real, relevant and rewarding. Simulators provide the bridge between knowledge and practice for efficient learning without risk of failure in real life. Simulation provides the most realistic environment of a complex process and integrated systems to have smooth, safe operation of the facility. Simulation integrates multiple disciplines on a single platform and delivers the holistic response of facility. Therefore It is a proven tool for functional expertise training. Simulator-based training is the safest training platform to develop not only the knowledge of the process but also the skills and standard practices industry. Simulator-based training develops technical, analytical, problem-solving skills and expands the ability to cope with complex situations on the facility. The simulation will improve our ability to predict outcomes and optimize solutions before committing resources to specific designs and decisions.